In our previous studies, we found that the Ile394Thr SNP in the melanopsin gene (OPN4) was functionally associated with the pupillary light reflex. This indicates the possibility that OPN4*Ile394Thr is associated with other non-image forming responses. The aim of this study was therefore to determine whether OPN4*Ile394Thr is associated with sleep/wake timing. A total of 348 healthy Japanese university students participated in this study. Scalp hair was used to genotype the Ile394Thr SNP of OPN4. Sleep habits, including bedtime, wake time and sleep duration, were assessed separately for weekdays and weekends. A total of 328 samples, including 223 samples with TT genotype, 91 with TC genotype and 14 with CC genotype, were used for statistical analysis. No significant difference in age or male/female distribution was found among the three genotype groups. There was no significant difference in circadian preference among the genotype groups. During weekdays, bedtime, wake time and midpoint of sleep for CC subjects were significantly later than those for TT and TC subjects. However, there was no difference between TT and TC subjects in any of their sleep habits. During weekends, bedtime of CC subjects was significantly later than those of TT and TC subjects, and the midpoint of sleep of CC subjects was significantly later than that of TC subjects. Our findings demonstrated that OPN4*Ile394Thr is associated with sleep/wake timing. We also found that the sleep/wake timing of subjects with the CC genotype was later than that of subjects with the TT or TC genotype. Melanopsin, a photopigment contained in a small subset of retinal ganglion cells, plays an important role in non-image forming (NIF) responses, including circadian photoentrainment , melatonin suppression , pupillary light reflex [3, 4], sleep behavior [5, 6] and alertness [7, 8], by transmitting photic irradiance information to the brain. Parallel studies using genetic ablation of melanopsin (Opn4) in mice [1, 9], using a silent-substitution method in humans , and using blind subjects [10, 11] have demonstrated that the contribution of melanopsin to NIF responses is as important as, or even more important than, that of the classical photoreceptors (rods and cones). In our previous studies, we found that the Ile394Thr SNP (rs1079610) in the melanopsin gene (OPN4) was functionally associated with pupillary light reflex (PLR) and that subjects with different genotypes of Ile394Thr SNP showed different degrees of responsiveness to light [12, 13]. Thus, OPN4*Ile394Thr might be a factor involved in inter-individual differences in other NIF responses depending on light, such as circadian phase-shifting, but this remains unclear. The endogenous circadian clock in mammals is a self-sustained oscillation with a period of about 24 hours. In fact, the circadian clock runs free without entrainment (synchronization) to environmental signals, especially the light/dark cycle in a day. As mentioned above, parallel studies have demonstrated an important role of melanopsin in circadian entrainment [1, 5, 11, 14]. Melanopsin-containing retinal ganglion cells detect irradiance information and transmit the photic signal to the suprachiasmatic nucleus, the circadian pacemaker, located in the hypothalamus . An individual circadian phase shows a light intensity-dependent manner and can be advanced or delayed depending on exposure timing to light. Notably, Zeitzer et al. found that phase-delaying effects of light were increased in humans during early night and that the delayed phase appeared with exposure to not only bright light but also low irradiance light. It is therefore possible that the different degrees of responsiveness to light among OPN4*Ile394Thr genotypes may influence circadian phase. Sleep/wake timing in humans is thought to reflect circadian phase [17, 18] and to be correlated with dim light melatonin onset (DLMO) phase, which has been used to estimate an individual’s circadian phase [19, 20]. Aoki et al. found that the magnitude of light-induced melatonin suppression in patients with DSPS (delayed sleep phase syndrome) was greater than that in normal subjects. This indicates the possibility that inter-individual differences in circadian phase are associated with photoreceptor light sensitivity. Taken together, we hypothesized that the effect of Ile394Thr SNP on circadian phase is reflected in sleep/wake timing. Hence, the aim of this study was to determine whether OPN4*Ile394Thr is associated with sleep/wake timing. A total of 348 healthy Japanese university students (mean age: 20.9 years; SD: 2.2) with common color vision (Ishihara color-blindness test) participated in this study. Exclusion criteria included medication or drug consumption and shift work. All participants were enrolled with written consent of each participant, and the study was approved by the Ethical Committee of Kyushu University and the Ethics committee of the National Center of Neurology and Psychiatry. There was no significant difference in age or male/female distribution among the three genotype groups. Table 1 shows the demographical characteristics of the subjects. So-called morningness-eveningness, namely circadian preference, is an individual characteristic and shows a strong correlation with sleep/wake timing . A Japanese version of the Morningness-Eveningness Questionnaire (MEQ)  was used to evaluate the effect of individual circadian preference on sleep/wake timing. In addition, sleep habits (bedtime, wake time and sleep duration) were assessed separately for weekdays and weekends, because individual sleep/wake times have been shown to differ greatly between weekdays and weekends . Besides sleep/wake timing, midpoint of sleep has also been used to estimate an individual’s circadian phase, and it has been shown to have a strong correlation with DLMO phase [25, 26]. The midpoint of sleep was calculated on the basis of self-reported bedtime and wake time. Genomic DNA samples were extracted from a scalp hair using an FM Kit (Wako Pure Chemical Industries, Ltd., Osaka, Japan), and Ile394Thr SNP was genotyped in all participants by using TaqMan SNP genotyping assays (Applied Biosystems, Foster City, California, USA). The genotype groups were classified as TT, TC and CC, and the numbers of subjects in those groups were 232, 94 and 14, respectively (eight being undetermined). Genotype frequency of OPN4*Ile394Thr was consistent with the Hardy-Weinberg equilibrium (χ2 = 2.12, ns), and the T and C allele frequencies of Ile394Thr SNP were 82.1% and 17.9%, respectively. Subjects who did not complete the self-assessment questionnaire were excluded. After exclusion, a total of 328 samples, including 223 samples with TT genotype (122 men and 101 women; 21.0 ± 2.3 years old), 91 samples with TC genotype (49 men and 42 women, 20.8 ± 2.0 years old) and 14 samples with CC genotype (4 men and 10 women, 21.3 ± 1.5 years old), were used for statistical analysis (Table 1). To evaluate the differences among the genotype groups for dependent variables, including sleep habits and circadian preference, we used one-way multivariate ANOVA (IBM© SPSS© version 21, New York, USA) with the genotypes as independent variables. Tukey (honestly significant difference) HSD post hoc tests were carried out when the interaction between genotypes and each dependent variable was significant. P < 0.05 was considered to be statistically significant. The MEQ mean scores and standard deviations were 48.4 ± 7.4 in the TT subjects, 48.6 ± 7.3 in the TC subjects and 44.8 ± 6.6 in the CC subjects (Table 1). ANOVA showed no significant difference among OPN4*Ile394Thr genotypes. ANOVA for the data during weekdays showed main effects of genotype on bedtime (F = 7.058; P < 0.01), wake time (F = 3.353; P < 0.05) and midpoint of sleep (F = 5.622; P < 0.01). No significant effect of genotype on sleep duration was found. In the sleep habits during weekends, main effects of genotype were found on bedtime (F = 5.624; P < 0.01) and midpoint of sleep (F = 3.964; P < 0.05) but not on wake time or sleep duration (Table 2).Figure 1 shows bedtime and wake time of each genotype group both on weekdays and weekends. During weekdays, CC subjects reported significantly later bedtimes than those of TT subjects and TC subjects as well as later wake times. 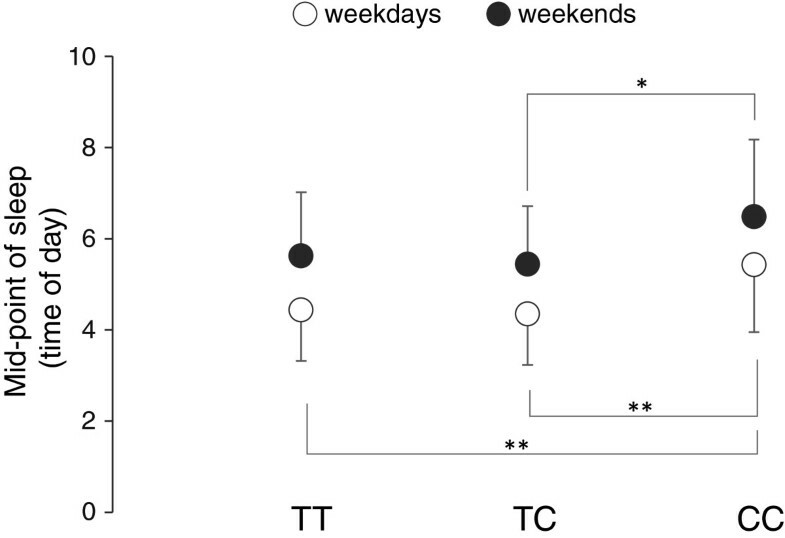 During weekends, CC subjects showed later bedtime than those for TT subjects and TC subjects, while there was no significant difference among the genotype groups in wake time. 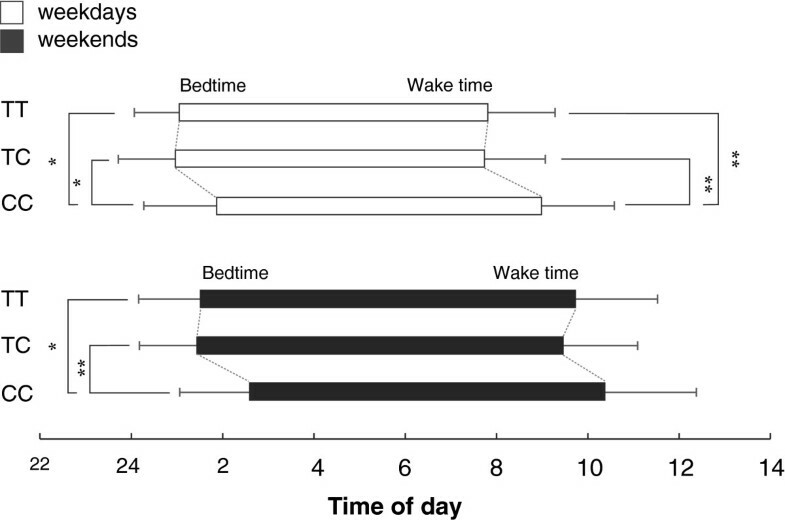 No significant difference was found between TT and TC subjects in any of the sleep habits.The midpoint of sleep for CC subjects was significantly later than those for the TT subjects and TC subjects on weekdays, but no significant difference was found between TT subjects and TC subjects. The midpoint of sleep for the CC subjects was later than that for the TC subjects on weekends, but no significant difference was found between TT subjects and CC subjects or between TC subjects and TT subjects (Figure 2). Values indicate means ± SD. Comparison of bedtime and wake time (mean + SD) among TT (n = 223), TC (n = 91) and CC (n = 14) subjects during weekdays (white bars) and weekends (black bars). During weekdays, both the bedtime and wake time of CC subjects were significantly later than those of TT and TC subjects. During weekends, the results for bedtime were consistent with those during weekdays, but there were no significant differences among genotype groups in wake time. *P < 0.05, **P < 0.01. Comparison of midpoint of sleep (mean + SD) among TT (n = 223), TC (n = 91) and CC (n = 14) subjects during weekdays (white circles) and weekends (black circles). During weekdays, the midpoint of sleep of CC subjects was significantly later than those of TT and TC subjects. During weekends, there was a significant difference in midpoint of sleep only between TC and CC subjects. *P < 0.05, **P < 0.01. We attempted to determine the association between OPN4*Ile394Thr and sleep habits. We found that subjects with the CC genotype had later sleep/wake timing and later midpoint of sleep than those for subjects with the TT or TC genotype, indicating that OPN4*Ile394Thr is associated with sleep/wake timing. On the other hand, the circadian preferences identified by MEQ scores showed similar trends among the genotype groups, indicating that the sleep habits of subjects with each genotype were not biased by individual preference. Light is a critical environmental cue for circadian entrainment and circadian phase can be advanced or delayed depending on light intensity and exposure timing. Exposure to light at night results in phase delay. In support of this, it has been reported that exposure of human subjects to ordinary room light with low irradiance (approximately 300 lux) during the night caused delayed circadian phase [16, 27], melatonin suppression , and alertness . All of the subjects who participated in the present study were university students and had late bedtimes (mean bedtime: 1:15 AM), which means, although we did not assess light conditions for the subjects in daily life, it can be assumed that the subjects were exposed to indoor light for a long duration during the night. Thus, it is possible that the findings in this study were due to the effect of light exposure at night. In our previous study, we found that pupilloconstriction of TC and CC subjects or a combined group (TC + CC) was greater than that of TT subjects, suggesting that the genotype with C allele is highly responsive to light [12, 13]. Given that the phase-delaying response to light follows a logistic dose–response curve , the delayed sleep/wake timing of CC subjects might be a consequence of the high responsiveness to light. Unlike on weekends, it is difficult for an individual circadian phase, which is strongly affected by social constraints, especially wake time, to be reflected in the sleep/wake cycle on weekdays. Despite this, delayed sleep phase of the CC subjects was observed more clearly during weekdays than during weekends. Although university students are under a time constraint on weekdays, the level of the constraint is weak. In addition, sleep is generated by the interaction between circadian and homeostatic mechanisms, and the latter mechanism is thought to be an increase in sleep pressure during wakefulness and dissipation during subsequent sleep. Particularly in adolescents, sleep debt is likely to accumulate during weekdays and therefore lead to oversleep as a compensation for sleep loss during weekends. Thus, the disappearance of a statistical difference among genotypes in wake time and midpoint of sleep during weekends might be due to homeostatic sleep regulation. However, the relationship between OPN4*Ile394Thr and sleep habits in this study was not consistent with the results for the relationship between OPN4*Ile394Thr and PLR in our previous study: sleep/wake timing of the CC subjects was significantly delayed compared to that of the TT and TC subjects, whereas no difference was found between the TC and CC subjects in PLR. It is not clear what caused this, but it indicates that the previous results for PLR cannot sufficiently explain the sleep phase difference among OPN4*Ile394Thr genotypes. Compared to PLR, a more complicated mechanism and more factors are involved in sleep. For instance, inter-individual differences in endogenous circadian rhythm, circadian phase and sleep timing have been reported [30, 31]. Furthermore, contribution of the CLOCK gene to circadian phenotypes, particularly sleep timing, has been reported [32, 33]. Furthermore, melanopsin has a characteristic spectral sensitivity λmax around 480 nm. The effect of light with a high-color temperature (that is, blue-enriched) on melatonin suppression or sleep has been investigated [34–36]. Also, in our previous study, we found that the difference between OPN4*Ile394Thr genotypes in PLR depends on light wavelength: greater differences were observed with a short wavelength light . Therefore, in future work, those factors should be evaluated to validate the findings in this study. The sample size for CC genotype was small (n = 14) compared to TT and TC subjects. As International HapMap Project reported, the frequency of CC genotype is relatively low not only in Japanese in Tokyo (2.3%) but also in other ethnic groups; for example, 13.3% of Han Chinese in Beijing and 12.3% of European ancestry in Utah state. To enhance confidence in our findings, larger samples will be required. According to the database of International HapMap Project, C allele frequency of Ile394Thr SNP in CEU (European ancestry in Utah state, 34.2%) is larger than that in JPT (Japanese in Tokyo, 17.0%) and that in YRI (Yoruba in Nigeria, 14.2%). It was also found that pupillary light response in CC genotype is larger in the European population . These findings mean that the proportion of people with high sensitivity to light might be relatively large in the European population. It is thought that light skin color in the European population results from genetic adaptation to a short duration of sunlight in a high latitude area. Another example of the health risk of a short duration of sunlight is seasonal affective disorder (SAD), which is involved in the mechanism of melanopsin-containing non-visual response to light. Although it has been reported that melanopsin gene polymorphism is associated with prevalence of SAD , it is unknown whether natural selection has driven it or not. Further study based on population genetics, such as a statistical approach to estimate the degree of population differentiation (Wright’s Fst)  and to measure linkage disequilibrium as evidence of selective sweep , is needed. Although we found an association between OPN4*Ile394Thr and sleep timing in this study, an association was not found in another study that was conducted in the USA using middle-aged European subjects . This inconsistency suggests that associations between genotype and phenotypic variations are not simple and that these relations are modulated by environment and age. In the present study, the association between OPN4 polymorphism and sleep timing was thought to have been due to the effect of light at night on the circadian phase. In Japan, most people are likely to use a fluorescent lamp at home and some tend to use high-color temperature light, which has an impact on sleep and circadian rhythm. In addition, our subjects were university students, who have been reported to have a tendency to delay sleep timing due to weak social zeitgebers. These cultural and environmental factors in Japanese university students might strengthen the association between OPN4 polymorphism and sleep timing. In physiological anthropology, functional connections and biological significance between genotypic and phenotypic variations should be clarified in terms of interaction of culture and living environments in a targeted population. This study was supported in part by JSPS KAKENHI (24370102) and a part of this study is the result of ‘Understanding of Molecular and Environmental Bases for Brain Health’ carried out under the Strategic Research Program for Brain Sciences by the Ministry of Education, Culture, Sports, Science and Technology of Japan. The funders had no role in study design, data collection and analysis, decision to publish, or preparation of the manuscript. We would like to thank Takeshi Nishi at Kyushu University, Kaoru Inami at Fukuoka Women’s University and especially Mie Kato at National Center of Neurology and Psychiatry for technical assistance in genetic analysis. SL collected experimental data, performed statistical analysis and wrote the manuscript. SL and SH participated in the design of the study. SL and AH carried out the molecular genetic analysis. SK, AH and KM revised the manuscript. SH supervised the study and helped to draft the manuscript. All authors read and approved the final manuscript.